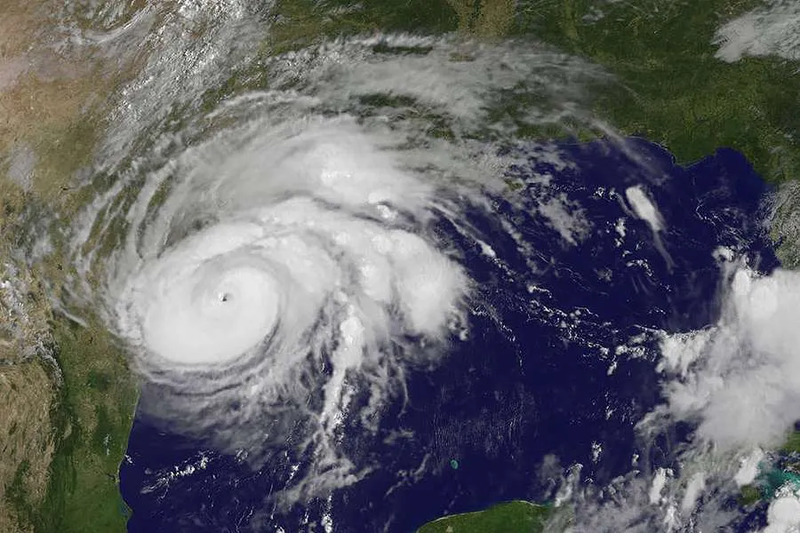 Washington D.C., Aug 27, 2017 / 09:38 pm (CNA/EWTN News).- The damage done by Hurricane Harvey is a cause for prayer and preparation to help the storm’s victims, the U.S. Conference of Catholic Bishops has said. “As the Archbishop of Galveston-Houston, this crisis hits very close to home,” conference president Cardinal Daniel DiNardo said Aug. 27. “In solidarity with my brother bishops in this area of the country, I call on people of faith to pray for all of those who have been impacted by this hurricane, and I ask people of good will to stand with the victims and their families. “May God, the Lord of mercy and compassion, protect all who are still in danger, and bring to safety those who are missing. May He care in a special way for those who were already homeless, or without support and resources, before this disaster,” the cardinal said. The cardinal said the storm was “catastrophic and devastating” and many dioceses have been affected. Hurricane Harvey made landfall Friday night as a Category 4 storm. It has killed at least two people. More than 1,000 had to be rescued. Many thousands are trapped by the water, CNN reports. Although the hurricane has been downgraded to a tropical storm, the National Weather Service said the flooding was catastrophic, unprecedented and expected to continue for days. Up to 50 inches of rain could fall on some parts of Texas. Several international airports in Texas, and a Houston hospital has evacuated after flooding caused power loss. The City of Dallas has said it will turn its convention center into a shelter to host up to 5,000 evacuees. Cardinal DiNardo said the U.S. bishops’ conference is working closely with local dioceses, Catholic Charities USA and St. Vincent de Paul societies, as well as other relief organizations. The bishops’ conference will share more information about how best to aid hurricane victims. The cardinal prayed in thanksgiving for the first responders who have put their lives at risk. “We include in our intentions the everyday heroes reaching out to help their neighbors in need, those who, like the Good Samaritan, cannot walk by a person in need without offering their hand in aid,” he said. Cardinal DiNardo concluded with a general prayer: “May God bless you and your families this day and always,” he said. 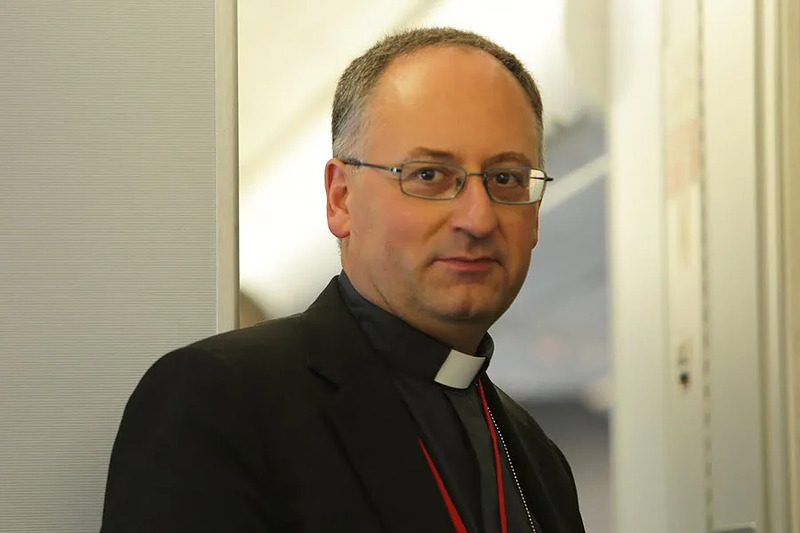 Washington D.C., Jul 17, 2017 / 04:44 pm (CNA/EWTN News).- An analysis piece in La Civilta Cattolica alleging an “ecumenism of hate” between Catholics and Evangelical Fundamentalists is seriously flawed in its presentation of religion in public life, experts said. On Thursday, the journal La Civilta Cattolica published an analysis piece co-authored by its editor, Fr. Antonio Spadaro, S.J., and Marcelo Figueroa, a Presbyterian pastor who is editor-in-chief of the Argentine edition of L’Osservatore Romano. The piece made a number of claims, alleging that many conservative Christians have united on political issues like immigration and have ultimately promoted an “ecumenism of hate” in policies that would allegedly contradict Pope Francis’ message of mercy. This “problematic fusion” has manifested itself in recent years with the “Manichean” rhetoric of politics “that divides reality between absolute Good and absolute Evil,” the authors said, drawing examples of this from the presidential administrations of George W. Bush and Donald Trump. This rhetoric is rooted in the evangelical-fundamentalist movement beginning in the early-20th century, which continued through other problematic interpretations of Christianity like belief in the “prosperity gospel” and in the dominion of man over creation, beliefs “that have been gradually radicalized,” the authors said. Furthermore, this Christianity feeds off of conflict where “enemies” are “demonized,” which would today include Muslims and migrants who are not welcomed into the U.S., the authors wrote. Pope Francis, by contrast, has advocated for “inclusion” and “encounter,” and has been opposed to “any kind of ‘war of religion,’” they wrote. Thus, for Catholics, religion and politics should not “confused” lest Christians promote a fundamentalist theocracy which is being pushed in this case, the authors said. However, religious experts have pointed out inaccuracies, exaggerations, and false summaries of Church teaching within the article. “The authors make a great number of errors, both historically, descriptively, and in their diagnosis of what ails America, and Christian conservatives more specifically,” he continued. A chief flaw of the piece is its suggestion that religion and politics should be separated, Bruenig added. While distinctions should be made between the eternal, spiritual realm and the temporal one, the piece is “ahistorical and very un-Catholic” in how it approaches the relationship between religion and politics, she said. This compartmentalization of faith and politics is part of flawed Enlightenment thinking, Bruenig said. “The notion that politics and religion should basically function in separate domains is one of the original liberal Enlightenment positions on politics, and there’s a reason that most of the leading thinkers of the liberal Enlightenment were severely anti-Catholic,” she stated. Such a claim flies in the face of centuries of Church teaching, Bruenig continued. P.J. Smith, who writes at the website Semiduplex.com, agreed that the article contradicted Church teaching on the relationship between faith and politics which was put forth by Bl. Pius IX, Leo XIII, St. Pius X, Pius XI, and Ven. Pius XII, who wrote that the Church has the authority to speak on matters of economics and politics. Furthermore, valid critiques can be made of the current administration and the political order “from a Christian position,” Bruenig said, exploring the policies of the administration that do not conform to Church teaching. This would have been “a much stronger argument,” she said. Furthermore, some of the claims made in the piece about U.S. Christianity are inaccurate, Pecknold and Bruenig said. For instance, as an example of what’s wrong with the Catholic-Evangelical ecumenism, the piece cites the website ChurchMilitant.com cheering the election of President Donald Trump as an answer to the prayers of Americans, comparing him to the Roman Emperor Constantine whose military victory enabled the legal acceptance of Christianity throughout the empire. This is an example of the flawed understanding of religion and politics, the authors said. However, this is “a fringe publication” that the authors cited, Pecknold said, and not one that is representative of Catholics in the U.S.
A CNN report had noted that, according to two Presbyterian pastors who met with Trump just before his inauguration, he apparently was uncertain that they were Christians until they affirmed to him that they were. Also, although the article mentions the “prosperity gospel” and “dominionism” as problematic strains of U.S. Christianity today, it ignores a major tradition, Smith wrote. It fails to “engage with the liberal tradition within American Catholicism, exemplified by the Jesuit John Courtney Murray, which might have provided an interesting strand in their argument—not least because it remains the dominant strand in American Catholicism,” Smith wrote. Stephen White, a fellow in the Catholic Studies Program at the Ethics and Public Policy Center in Washington, D.C., wrote in the Catholic Herald that the authors’ critique of the Christian Integralists purports to be an accurate summary of mainstream religious problems, but is rather a critique of only a small population of Christians. “Fundamentalism is not the mainstream of American Protestantism, nor does it have the influence in American politics that the authors imagine it does,” he said. He wrote that “the suggestion that there’s some close affinity between the Biblical literalism of fundamentalism, on the one hand, and the God-wants-you-to-be-rich hucksterism of the Prosperity Gospel,” is false. “America’s maddeningly complex religious landscape needs thoughtful analysis and critique,” he wrote, adding that such nuance is lacking in the piece. Denver, Colo., May 11, 2018 / 11:00 am (CNA/EWTN News).- After a New York judge said that courts must seriously consider whether animals deserve some legal protections afforded to people, Catholic philosophers say that human beings are unique, and that, when it comes to law and ethics, that matters. “Chimps are amazing living beings… and it could be a big mistake to just think of the chimps as things or instruments,” said Dr. John Crosby, a philosophy professor at Franciscan University of Steubenville in Ohio. “Undeniably, there is something there mysterious [about them]. There is something of worth, but there is not a person. And therefore, because they are not a person, there are no real rights the chimp has,” he told CNA. Nonhuman Rights Project has sought to release two New York-based chimpanzees, Tommy and Kiko, from the cages of private owners, and into a wild animal sanctuary. Steven Wise is the lawyer in charge of the animals’ defense. In March 2017, Wise filed for habeas corpus relief, citing the similarities between mankind and primates. The filing alleged that chimps’ captivity constituted a kind of unlawful imprisonment. On May 8, New York’s highest court rejected an appeal from Wise aimed at freeing the chimpanzees. The Court of Appeals voted 5-0 in favor of an intermediate appellate court in Manhattan that denied the chimps’ legal status in June 2017. The appellate court ruled that chimps are not legal persons. “The asserted cognitive and linguistic capabilities of chimpanzees do not translate to a chimpanzee’s capacity or ability, like humans, to bear legal duties, or to be held legally accountable for their actions,” wrote Justice Troy Webber last year, according to the Chicago Tribune. Judge Eugene Fahey, who voted against the chimps’ rights to habeas relief on Tuesday, argued that while a chimp might not be considered a person, animals might have the right to legal redress. 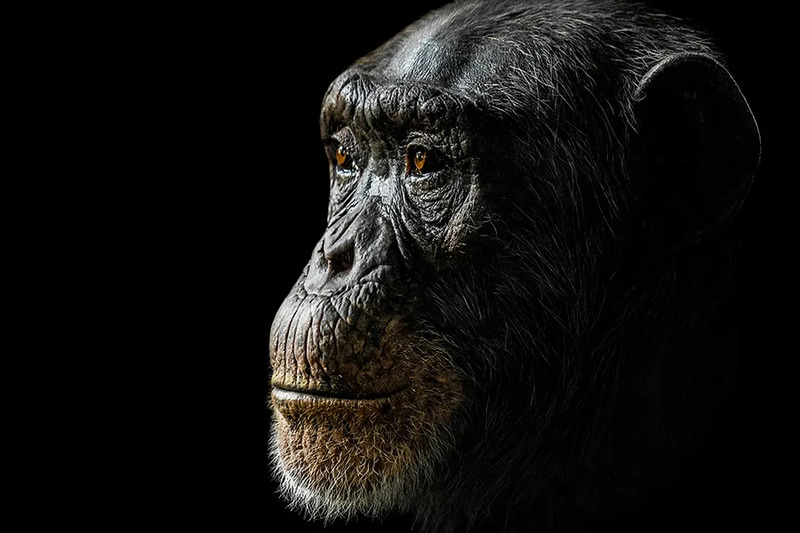 “The Appellate Division’s conclusion that a chimpanzee cannot be considered a ‘person’ and is not entitled to habeas relief is in fact based on nothing more than the premise that a chimpanzee is not a member of the human species,” Fahey wrote. There are a lot of similarities between chimps and people, Fahey said, drawing attention to chimps’ advanced cognitive skills, ability to self-recognize, and a high percentage of shared DNA with humans, at least 96 percent. He asked whether some animals should have the right to readdress wrongs committed against them. Animals are not morally culpable or legally responsible, he said, but neither are infants and some ill people, and therefore they might enjoy similar legal rights. Dr. Crosby agreed that animals should not be treated poorly, and he lamented over the mistreatment of animals by farms and luxury product testing. However, he disagreed with the judge’s argument about babies and comatose adults, noting chimpanzees permanently lack moral culpability. Animals do not have moral agency or free will, he said, while highlighting a few major differences between chimpanzees and people. Cautioning against conferring upon them the status of persons, Crosby said people should instead remember their moral obligations towards animals. Father Brian Chrzastek, a philosophy professor at the Dominican House of Studies, also reflected on the difference between chimps and people. He said that humans have a higher potential for abstract thought and originality. While animals act by instinct, he said people engage rationally with the world. “Humans are different in kind. It’s not like we are just smart chimpanzees or something. We’re an entirely different level of thought, an entirely different kind of species,” he told CNA. Washington D.C., Nov 3, 2018 / 02:00 pm (CNA).- When the United States Conference of Catholic Bishop convenes next week, much of the attention with focus on how the bishops will address the recent clerical abuse scandals. But the bishops will also be electing new leadership for six of the conference committees. The USCCB will gather in Baltimore for its general assembly Nov. 12-14. On the ballot will be candidates for the chairman of the Committee on Catholic Education Committee, as well as the chairmen-elect of five other committees: Clergy, Consecrated Life, and Vocations; Divine Worship; Domestic Justice and Human Development; Laity, Marriage, Family Life, and Youth; and Migration. The chairman-elect serves for one year shadowing the current chairman before assuming the role for a three-year term of office. Conference members will also vote for a treasurer-elect for the USCCB. The office of treasurer manages the conference’s funds and sits as vice-chairman on the Committee on Priorities and Plans. The current treasurer is Archbishop Dennis Schnurr of Cincinnati. Candidates to succeed him are Bishop Gregory Parkes of St. Petersburg, Florida, who worked in the banking industry for several years before entering the seminary and being ordained, and Archbishop Charles Thompson of Indianapolis, who holds a bachelor’s degree in accounting. The current chairman for the Committee on Catholic Education is Bishop John Quinn of Winona. The committee seeks to guide the educational mission of the Catholic Church and advocates for public policies aligned with Catholic values. The bishops nominated to follow him are Bishop Michael Barber of Oakland, who has served as the Director of the School of Pastoral Leadership in the Archdiocese of San Francisco, and Bishop David Malloy of Rockford, who has degrees in biology, theology, and canon law. 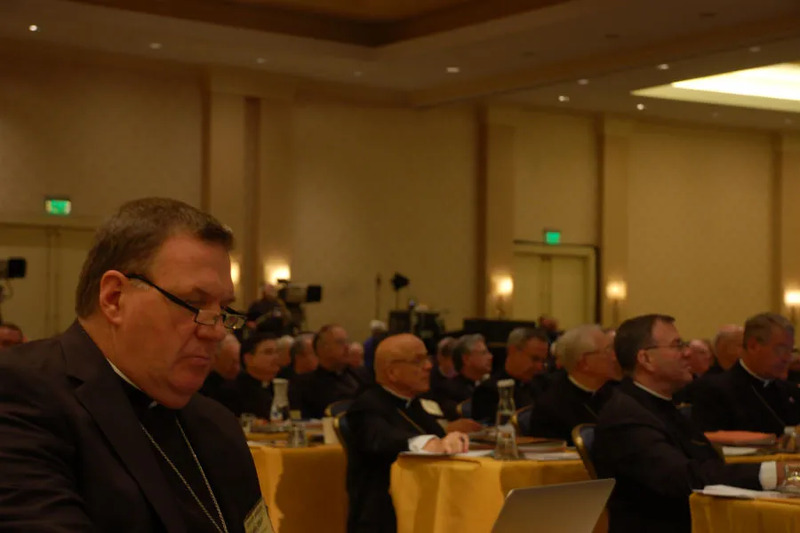 The Committee on Clergy is currently headed by Cardinal Joseph Tobin of Newark and produces and coordinates documents and resources for vocational promotion and discernment. The potential chairmen-elect are Bishop James Checchio of Metuchen, and Bishop Michael Olson of Fort Worth. Archbishop Wilton Gregory of Atlanta is entering his final year as the head of the Committee for Divine Worship, which is responsible for matters related to Latin rite liturgy in the U.S. The candidates for chairman-elect are Archbishop Leonard Blair of Hartford, who has served on several conference committees, including those on evangelization and doctrine, and Bishop David Ricken of Green Bay, who is a member of the Bishops’ Advisory Council for the Institute for Priestly Formation. The Committee on Domestic Justice and Human Development, now led by Bishop Frank Dewane of Venice, advises the U.S. bishops on national issues relating to human dignity, development, and poverty. Archbishop Paul Coakley of Oklahoma City and Archbishop John Wester of Santa Fe have been nominated to succeed him. Wester has previously served as a member on the bishops’ committee on migration. Archbishop Charles Chaput is now in the final year of his term as chairman of the Committee on Laity, Marriage, Family Life, and Youth, he will be replaced by either Archbishop Salvatore Cordileone of San Francisco or Bishop John Doerfler of Marquette. Cordileone has served on the Governing Board of the International Theological Institute, while Doerfler has previously led the Marriage Research Committee of the Canon Law Society of America. The Committee on Migration is currently chaired by Bishop Joe Vásquez of Austin. The committee seeks to provide awareness of and responses to the plight of immigrants, human trafficking, and refugees. Washington, D.C. auxiliary Bishop Mario Dorsonville-Rodriguez of Washington, who has served as the director of the Spanish Catholic Center in Washington, and Bishop John Stowe of Lexington are the candidates to succeed him.